New York Restaurants | Food E.
The Story of Lauren E. Food E.
Happy Friday, friends! My day job has been so chaotic lately that I’ve been running home every night to my beloved DVR boyfriend and eating myself to happy until 9pm when I slink off to bed. And to top it all off I’m going to London next week! I’ve never been, but I do know I love British Special K (trust me, it’s different) and British candy so I’ll be leaving some room in my suitcase for treats. In the meantime, a quick recommendation for a midtown (yes, midtown) Manhattan restaurant. I know. You’re speechless. Quality Italian (57th Street and 6th Avenue) is a steakhouse that serves an incredible special: chicken parmesan for two (it fed us three girls with some leftover), served like a pizza. I know, you thought that photo was a pizza. It’s not. It’s a GIANT portion of chicken parmesan, perfectly crisped up with a little arugula salad with parmesan beneath it. Let’s just call it: magical. The spot looks so swanky, you might be intimidated to enter – don’t be. It’s only been open 3 weeks so you might not be able to score a reservation but my friends and I sat upstairs in the lounge and were treated impeccably. We ordered one glass of wine each and the manager gifted us with a second round on him. 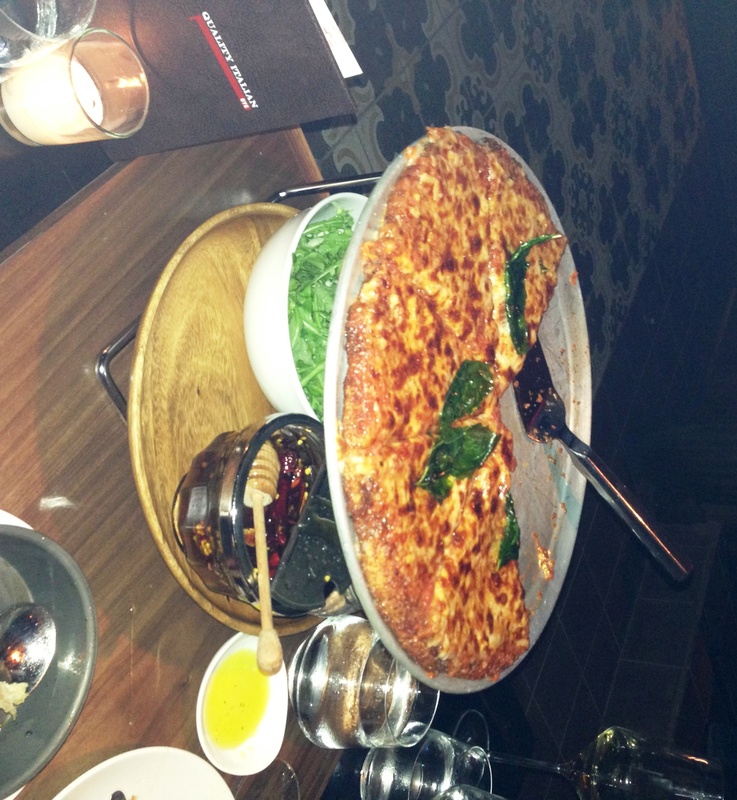 Everyone on the staff was attentive and congenial and the food was fresh and delicious. What more can you ask for in midtown? Not a whole lot. The only note I can give you on the negative side is that it is a bit pricey. The chicken parmesan claims to feed 2, at $26 per person. It fed 3 of us but $52 still seems a bit steep to me. Just know before you go. 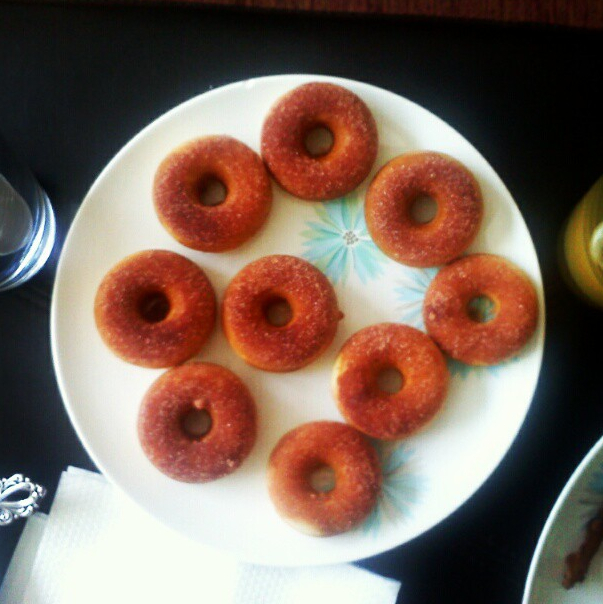 In the past few years, somehow, inexplicably, donuts have become one of my favorite foods. I can’t explain it. My grandfather was a baker so maybe it’s in my genes or something. Anyway, celebrate National Donut Day today! Dunkin’ Donuts is giving away a free donut with every beverage purchase and that’s reason enough for me. If you’re in NYC my favorite donuts are at The Donut Pub in the West Village. Pop on in and tell them Lauren sent you! They’ll have no idea what you’re talking about and it will be hilarious. This past weekend I had my girlfriends over for dinner, which is always a welcome treat. Way too much wine is had, embarrassing stories are told, and if we’re lucky, by the next day some truly incriminating pictures are posted to Facebook. All the markings of a successful evening, right? When it comes to making a meal for a group of people I occasionally feel really lost on the menu. I try to take into account the evening’s plan (I knew we’d be having a few cocktails so I wanted something substantial, but we also wanted to try the late night menu at Pachanga Patterson so I didn’t want something so filling that we wouldn’t be hungry by 11PM), but sometimes all I can come up with is pasta. Lucky for me I have really outspoken friends. “Can you somehow incorporate spaghetti squash into the meal?” one of the girls asked. Now I had the staple around which I could build the meal. I’d never actually cooked with spaghetti squash but it seems to be the low-carb-friendly food of the moment, right? You can use it pretty much any way you’d use real spaghetti. It was a BREEZE to make, it was delicious, and I’ve become a total convert. So thanks for the suggestion, Jenna! Not only did you make cooking dinner easier, but you introduced a new delicious and healthy food into my life. You are truly a keeper. Slice your spaghetti squash in half from stem to root. Scoop out seeds. Brush both sides with olive oil and place cut-side-down onto the baking sheet. Roast in oven for 35 – 40 minutes. Trim rough ends from asparagus and cut stalks into 2-inch pieces. After squash has roasted for 35 – 40 minutes, add asparagus pieces to the baking sheet (scatter around the squash). Place garlic clove underneath one squash half. Place the whole baking sheet back in the oven and roast for another 10 minutes, or until the asparagus is easily pierced with a fork. While the roasting is happening, in a small bowl, combine the ricotta cheese, lemon zest, parmesan, and thyme. Season liberally with salt and pepper. Once the asparagus and squash are done roasting, remove the baking sheet from the oven. 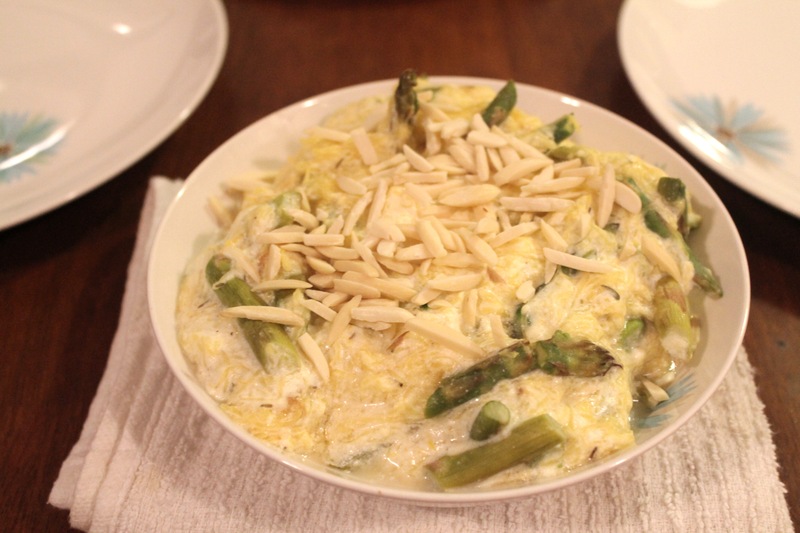 Add the asparagus and the softened garlic clove to the ricotta mixture and stir to combine. Once the squash has cooled for 5 minutes, scrape the flesh out and add it to the ricotta. Place in a serving bowl, top with toasted almond slivers*, and serve immediately. *To toast almond slivers: place almonds in a small skillet and cook over low heat until the almonds become fragrant. Do not overcook. PS – thanks to Meagan at Trippin’: A Travelogue for taking the photo! Rochester might seem like your standard blue collar city with not much sophistication and little in the way of culture. But if you assumed that, then you’d be dead wrong. There are endless summer arts festivals, jazz festivals, it’s home of Eastman Kodak and the Memorial Art Gallery, and a tiny movie house plays indie films on the reg. The newest addition to the little-city-that-could is the New York Wine & Culinary Center in Canandaigua. The New York Wine and Culinary Center features all New-York-sourced food and wine (i.e. you won’t find any rice on their menu here because there is no rice produced in NY – did I just blow your mind? ), and they expose visitors to said food and wine in a variety of ways: classes in their beautiful professional kitchen; food demonstrations in a lecture-style classroom setting; a tasting bar where you can experience flights of seasonal wines, beers, or liquors; and a restaurant upstairs that puts it all together for you. The space itself is beautiful: all dark wood and sophistication. You won’t find any steel-countered surfaces in their professional kitchen – in addition to being functional, it’s also aesthetically pleasing. And situated on beautiful Canandaigua Lake, on a good day the view is spectacular. On the night I went with my family, it was drizzling and cold outside (I’ll give you that against Rochester, the weather never does seem to cooperate), but the interior of the space was warm and inviting. We went straight to the bar where the tastings are held and each of us ordered a flight: one dry red wine flight, one vodka flight, one white wine flight, and one beer flight. 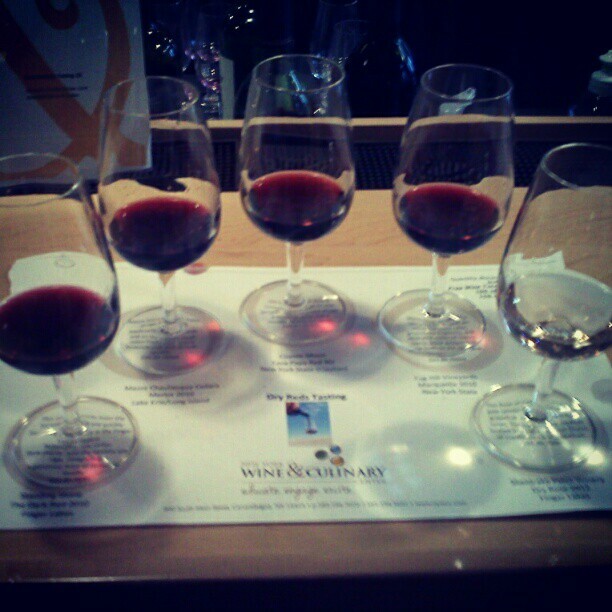 The bartender was ridiculously knowledgeable about every single drink he put in front of us and after I expressed particular delight in a wine from Coyote Moon Vineyards, the bartender said, “Would you like to meet the wine maker?” The winemakers happened to be in town doing a demonstration at the culinary center (this is the type of special event they hold all year round) and filled me in on their winery and a specialty tomato sauce they sell at the vineyard. If you’re ever doing a wine tour in the area or happen to be out near Clayton, NY take the time to stop in and meet the lovely Randazzo family. The next stop was the bar upstairs for another glass of wine (do you love how specific I’m being by telling you I had “wine”? It was so good I forgot what kind). We settled into a giant wooden table and stayed for dinner. The first course was a cheese plate, followed by a delicious entree of Long Island flounder and scallops over leeks fondue and seasonal vegetables. For dessert we had apple fritters that I’m still dreaming about: apple rings deep fried in the lightest, crunchiest batter imaginable with sweet, smooth vanilla ice cream. Is there any dessert more New York than an apple? If you’re in the Finger Lakes region, make a point to visit the culinary center. It’s incredible to see a place this innovative and committed to local food and wine thriving in an area that isn’t usually known for its culinary ingenuity. Take a class on making truffles, taste the New York wines (of which there are HUNDREDS), gaze out over beautiful Canandaigua Lake, or just eat your face off in the upstairs bistro. Whatever you do, you won’t be sorry you did it. Four years ago I found myself paying an arm and a leg for an 8′ x 10′ room without windows in the Financial District of Manhattan. As the lease renewal came up in August, I thought to myself, “What the heck am I doing?” My good friend Becca had been touting the benefits of her incredible (and incredibly cheap) house in Queens for a year so I decided to give the neighborhood a shot. Four years later, I’m the biggest advocate of this adorable and still-affordable neighborhood. I’ve convinced (with Becca’s help, of course) numerous friends to move to the ‘hood along with me and now I can safely say I have little to no reason to ever leave my borough. 1. Petey’s Burger: As far as I’m concerned, this is the only burger place on the East Coast that rivals In ‘N Out. It’s worlds better than Shake Shack and I’ve never had to wait in line to get it. They even have a deliciously decadent side called California Fries, topped with caramelized onions and a “special sauce” that looks suspiciously like an In ‘N Out knockoff. Who cares. This place is the ish. 2. Napoli Pizza and Pasta: You couldn’t make an Italian meal for less money than you can spend for authentic Italian at Napoli. Lasagna the size of your head is $6.50 (and comes with garlic bread), baked ziti for two will have you unbuttoning your pants and napping by the end of the meal, and the entrees cost a couple bucks more and come with extra bread and a pasta on the side. When it’s cold outside and you want a filling, home cooked meal without the dirty dishes, you can’t beat Napoli. 3. Crave Astoria: Besides the delicious, fresh food at Crave, I’m always commenting on how punctual and friendly their delivery staff is. More than once I’ve commented, “Hey, it’s that well-dressed guy again!” when the food shows up. Call me crazy, but I like it. In addition to the lovely delivery staff, the food is top notch: fresh and healthy. It’s not dirt cheap, but it’s well worth every penny. My favorite dishes are the Greek salads and the burgers (huuuuuge burgers with freshly made fries on the side), and for a fun (not so healthy) dessert, the Crave bites: fried dough puffs served with warm honey sauce. They also make a killer, inexpensive lentil soup that I’ve had more than once. 4. Sanford’s Restaurant: The priciest spot I’m highlighting, Sanford’s is a classier delivery restaurant that is open 24/7 and offers takeout late and pickup all the time. The menu is full of real restaurant items like mushroom risotto and hanger steak but my personal favorites are the salads and breakfasts. I actually love their pancakes, and I rarely say that about anyplace that isn’t my own kitchen. The only thing I don’t get about this place is why their pulled pork gets such high ratings; I ordered it once and hated it. Everything else I’ve ever had there (and trust me, it’s been quite a bit…) is delicious. 5. Astoria Park Pizza: Best pizza in Queens, hands down. This is also the teeny tiny pizzeria where I buy the pizza dough for my homemade pizzas. The crust is thin and crispy, the cheese is never drippy but always perfectly melted, and the prices are super affordable: a large cheese is only $11! I love Napoli for my pasta dishes and meatball parms, but for pizza I’m an Astoria Park girl all the way. Fair warning: this post is long. I don’t want to leave a single detail out, so please know going in that this is a short story, not a friendly paragraph of snark. Here we go. For the last few years I’ve said that before I move away from New York I would like to eat at the best restaurant in the city. For awhile I had my sights set on Le Bernadin but the more I read and researched the more Per Se came to the top of that list. Owned by famed restaurateur Thomas Keller, it is repeatedly voted the best restaurant in New York City by most food critics, has four stars (the highest rating) from The New York Times, and 3 Michelin Stars (one of only seven restaurants in the US to hold such an esteemed honor). Simply put: it’s the best. I had to go to there. About nine months ago, The BF and I decided if this was at the top of my list, why not make that dream come true? We would just save our money. We both thought it was worth the incredible investment of $300 for the prix-fixe menu (come on, that’s a lot to people who make poverty-level-salaries in the most expensive city in the country), so we would just put away a little bit of each paycheck every month and by the time our two year anniversary rolled around in October, we’d have enough saved up to celebrate. And then I got laid off. Suddenly $300+ for a meal was completely off the table. “Per Se will always be there,” The BF tried to comfort me. “We’ll go somewhere else you’ve always wanted to go for our anniversary.” But I’d be lying if I said I wasn’t disappointed. Cue Boyfriend of the Year. The guy still wanted to go, and he wanted to foot the bill. Despite the fact that he’d been picking up tabs left and right for his no-income-live-in-lady since the lay off in August, he wanted to celebrate and he wanted to take care of it himself. I am a pretty lucky gal. And so began the great race for a reservation. To secure a reservation at Per Se you must call one month prior to the date you want the reservation on, at 10AM, and they are notorious for booking up immediately. The BF started calling on September 10, one month before our anniversary, and surprise surprise, they were booked. He put his name on the waitlist for several dates but we started planning for other restaurants just in case. I did not have the highest of hopes. Until Monday night, two days before our anniversary. They called. Someone canceled. So on October 10, 2012, two years after we said, “Okay, let’s give this boyfriend/girlfriend thing a try” we set out for a meal at my dream restaurant. Per Se is located on the fourth floor of the Time Warner Center at Columbus Circle, overlooking the statue with an amazing view of Central Park and the east side of Manhattan. We approached the restaurant, tucked away in a corner of the floor, and the sliding doors slid open to welcome us. The pleasant hostess welcomed us right in and showed us to our table, a private little space up a level in the main dining room with an even better view out the huge dining room windows. “Do you think we look like we have money?” I asked The BF as we sat down. “No,” he answered, “I think you were smiling too big when we walked in.” I have to learn to play it cool. Per Se offers two tasting menus: the vegetable tasting menu and the chef’s tasting menu. The menus are constantly changing. I accidentally told The BF there was lobster on the menu because I saw it on the October 8th menu posted online. It was not on the October 10th menu and he was disappointed (I mean, after the fact who even missed the lobster? But even so, I was sorry I brought it up). But that just goes to show you the precise attention to detail and seasonality and availability this restaurant demonstrates. It’s mind boggling. Cheese gougeres: tiny, cream-puff like bites that are light and airy on the outside with a bit of warm, melted cheese in the middle. Verdict: the perfect first bite, setting the tone for the entire meal; unexpected and delectable. Sweet Onion Cornet with Salmon and Cream Cheese: a mini cone made of sesame seeds and filled with a light cream cheese, topped with raw salmon. Verdict: absolutely incredible; my eyes grew three sizes after I ate this and I wanted about 10 more. “Oysters and Pearls”: “Sabayon” of pearl tapioca with Island Creek oysters ad sterling white sturgeon caviar. Verdict: rich and buttery, with tiny pearls of caviar that exploded in your mouth and little sweet oysters swimming on top; I couldn’t have eaten any more of this incredibly rich dish but it was the perfect portion size and the ideal luxurious first course. Salad of Matsutake Mushrooms: broccolini florettes, Meyer lemon confit, pine nuts, mizuna, and nicoise olive oil. Verdict: I felt like royalty eating this crunchy, sweet, and tangy salad because our waitress told us that matsutake mushrooms are only in season for an extremely short time of the year and this just happens to be the time. The mushrooms were not spongy in the least, and in their raw form were almost crunchy. The kicker on this dish was a shaving of dehydrated mushroom on top that tasted almost like a freshly cut potato chip. “Rouelle” of Dover Sole: “Farcie aux feuilles de blettes,” scarlet grapes, brioche croutons, English walnuts, crispy sage and brown butter gnocchetti. Verdict: hands down the best dish of the entire meal. The fish was buttery and firm, the croutons added the perfect crisp, and who would ever have thought to add grapes to a rich dish like sole with gnocchi? This is why Thomas Keller is such a genius. I could’ve eaten 100 more plates of this. Scottish Langoustines “A La Plancha”: spiced cashews, coconut “nuage,” Yuzu-Honey, garden mint and hass avocado “potage.” Verdict: What struck me about this dish was that even with such strong flavors as spicy cashews, mint, and lobster (langoustines are a small variety of lobster) you could still taste the creamy avocado that served as the base of the dish. The flavors blended perfectly and once the four little langoustines at the center of the dish were gone, The BF took his spoon and lapped up, in as refined a manner as possible, the remaining liquid at the bottom of the bowl. It was just that good. Buttermilk-fried Thomas Farm’s Squab: Anson Mills’ polenta, romaine lettuce ribs and “sauce diable.” Verdict: my least favorite dish of the entire meal. That’s not to say it wasn’t better than most other things I’ve ever eaten, but in the grand scheme of the meal it wasn’t a standout. The squab, a little bird like a chicken, was crispy on the outside and lightly breaded with a flavorful bed of polenta underneath. Herb-roasted Marcho Farms’ “Selle de Veau”: Applewood smoked bacon, pumpernickel “pain perdu,” Blis maple syrup glaze, butternut squash, caramelized pearl onions, Brussels sprouts and Bourbon jus. Verdict: Sorry, mom! I ate veal. It was freaking delicious. Supremely tender and complemented perfectly by a crispy little Brussels sprout, a deliciously sweet pearl onion, and a little bread cake made of pumpernickel. I was so full at this point I couldn’t even finish it… but don’t worry. The BF cleaned up. Andante Dairy’s “Vivace”: Per Se “BLT”, honeycrisp apple, young fennel and black truffle puree. Verdict: Imagine the most perfectly prepared cheese plate you’ve ever consumed. The Per Se “BLT” is a teeny tiny sandwich wrapped in a linen napkin on your plate made of 2 little hunks of oiled bread spread with black truffle puree and surrounding a fat chunk of bacon. The cheese that served as the center piece was a creamy goat cheese and the slivers of sweet apple and crunchy fennel were freaking perfect. Just… perfect. “Prickly Pear”: “Biscuit Cuillere,” Limoncello “Panna Cotta”, pear soda and white wine granite. Verdict: the sparkliest, most refreshing palate cleanser ever. I wish I had a photo of every first bite I took during this meal because I have a feeling they’d all be the same: wide-eyed and completely dumbfounded. This little “sundae” was served in a short, narrow glass with a long spoon so every bite included crunchy ice and sparkling soda and a little bit of sweet cake from the bottom. Pomegranate “Soda”: honey-pine nut “nougatine”, Persian lime “bar”, and peppermint ice cream. Verdict: If this dish was served at Applebee’s, I’d be gagging. Pomegranate and lime and… mint? 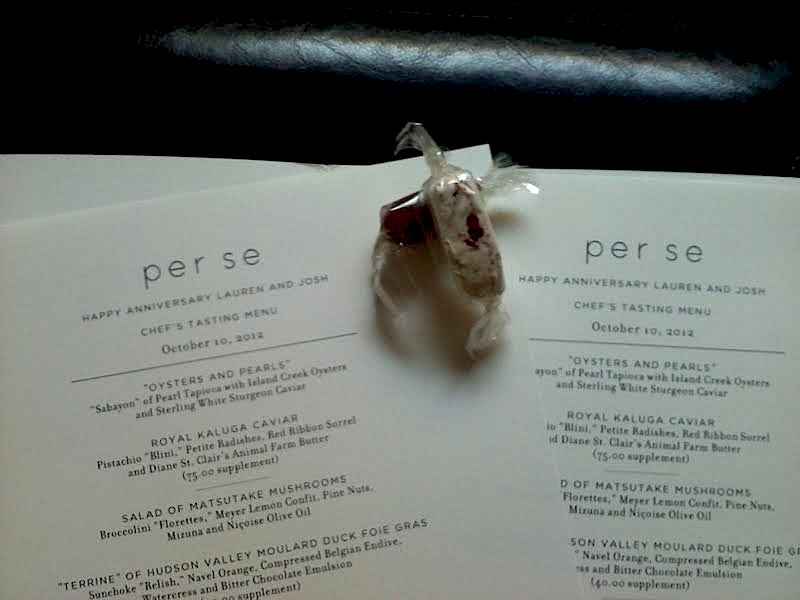 But oh wait, we’re talking about Per Se and we’re talking about Thomas Keller and we’re talking about unlikely flavors that somehow taste like they were made to be combined. A little bit of the lime ice cream bar, a touch of peppermint ice cream, a little sparkling pomegranate foam and you have a fresh, tart, almost spicy mouthful of blended complimentary tastes. Butterscotch “Pudding”: Caramelized popcorn, chocolate custard, whipped Earl Grey tea and salted caramel ice cream. Verdict: I was only privy to one bite of this dish (The BF chose this one, I chose the pomegranate soda above) but it was superb. Creamy and rich but never overpowering. 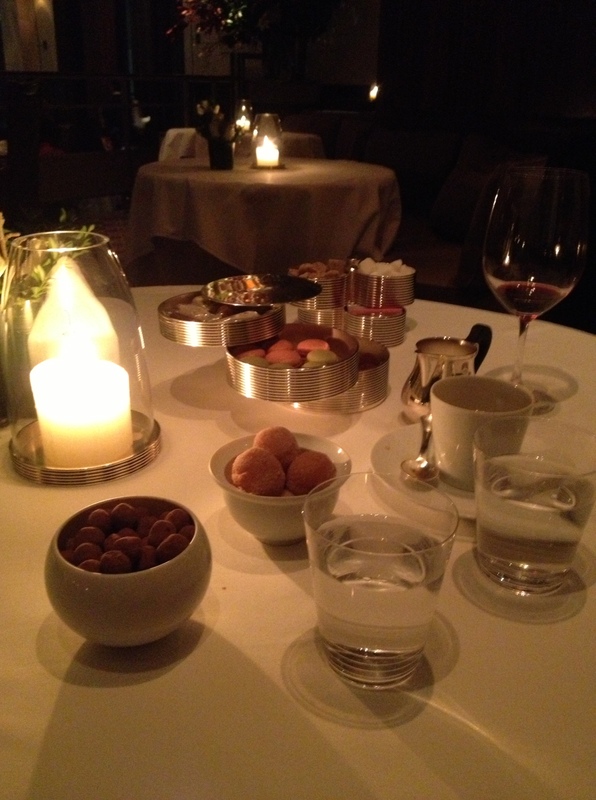 Per Se “Coffee and donuts”: cappuccino ice cream with whipped foam and cinnamon sugar donuts. Verdict: DOOOONUTS! I could not contain myself. These little round donuts were incredible: airy and light on the inside with a crisp layer of fried dough and cinnamon sugar on the outside. The ice cream came served in a little cappuccino cup and I thought it was real coffee until I touched the icy cup. The tiny little cup of ice cream was the perfect compliment to the warm, fresh donuts. Mignardises (little pastries traditionally served at the end of the meal): sour apple macarons (the mini-sized macarons were green and pink and I cannot, for the life of me, remember what the pink flavor was); wrapped caramels and nougatines; white chocolate, milk chocolate, and dark chocolate truffles; and cocoa powder covered hazelnuts. Verdict: Holy deliciousness overload. I thought I might pass out, I was so full, but I managed to taste everything and pocket anything that was wrapped for convenient carry-out. Crunchy, sweet, chewy, rich… it was all so perfect and presented in a three-tiered silver box just to really push it over the top. We walked away from that table, the last two in the restaurant, with the city skyline glittering outside the window, in a state of dreamy haze. As we left the dining room we were wished goodnight by every staff member who passed us by, and were presented with packaged cookies to go and a Per Se folder with our personalized menu inserts tucked inside to take home. All in all, it was a food lover’s dream come true. And I couldn’t have asked for more. I will try not to get too sappy on you, since most of you probably don’t read this blog to get a peek into my personal life (…or do you…) but yesterday was my two year anniversary with my amazing boyfriend, Josh. 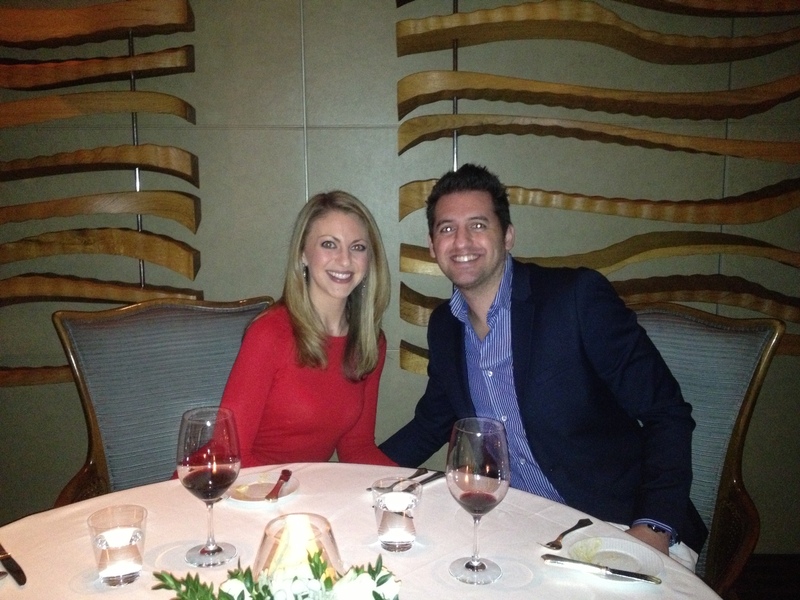 Not only did he have the biggest bouquet of long-stemmed roses I’ve ever seen delivered to me during the day, but he made a personal dream of mine come true at night: he took me to Per Se for the Chef’s Tasting Menu. I’m going to work on coming up with a full review for you and will hopefully have it posted early next week. Simply put, believe the hype. See how the top of the menu insert says “Happy Anniversary Lauren and Josh”? That was only the beginning. Cue tears of joy. Lauren E. is a food writer and recipe tester living in New York City. She is a regular contributor to Yumm.com and has been featured on The Martha Stewart Show. Sign up to be notified whenever a new post is up on Food E.